We noticed Alex's first tooth, a lower incisor, on Sunday. No associated drama, despite all the stories. It's very cute! At Derweze (Darvaza), in Turkmenistan, there is a 60m in diameter crater filled with the flames of burning gas since a Soviet drilling rig collapsed into it in the 1950's. There are some awesome photographs and videos of this doorway to Hell. Took Alex for his first swimming "lesson" in the local pool on Saturday. It's not really swimming, just familiarising the children with water, playing games and singing nursery rhymes. Alex took to it like a fish to water, kicking his legs as he has done since before he was born. Exhausted him though, and the poor kid had to meet the cousins for a Malaysian lunch at Abang Sam in Kensington. He's so much fun. I dread returning to work on Monday as it means being away from the family. Weekends are wonderful for the time spent together. A third acid attack on Hong Kong shoppers, a 48 hour strike on the London tube, windy weather. What's the connection and why do I care? Today I fly out for London via Singapore and back via Hong Kong. This isn't some long planned trip, but a sudden opportunity to attend a Plone workshop in the British capital. I'm approaching this trip with very mixed feelings. On the one hand there is the excitement of travel and my first opportunity to fly on Qantas' Airbus A380. There is the eagerness to learn more about what has proven to be a complex system. But there is also the heartache of leaving my wonderful wife and baby for a week. I treasure every moment with them and I know that the time apart is going to hurt. Part of the preparations for this trip have involved setting up internet video and voice and text communications. It's really the first time I have cared about communicating with home using anything other than email. I recorded a video of me reading a story to baby Alex and he seemed to respond to it. So, what will I do other than attend the three day workshop somewhere in the centre of London? The trip is scheduled entirely on Qantas. Friday evening sees me fly out on their new Airbus A380, every other flight should be a 747. It's the wrong way around really, as I would rather have the superior entertainment system (and hopefully greater comfort) on the overnight flights. I land in Singapore late tonight and have booked to stay in a hotel away from the main tourist centres, but hopefully convenient for food. Eating is my main objective for Singapore, but I will probably look for some cheap computer parts as well. Maybe even cruise around on the MRT rail system if I have the time. Flying out the next evening I will cross the dreaded turbulence of the Bay of Bengal. I remember an awful flight with British Airways on this route in 2005. Arriving early in the morning I will probably be extremely tired, but I hope to visit some of the free museums and galleries of London. Another day to sightsee, then the workshop begins. Hopefully the days finish with enough time to catch some more of the late opening sights. The flight to Hong Kong leaves in the middle of Friday, so there won't be any tourist time after the end of the workshop. An overnight flight to Hong Kong, then a full day there before another night flight back to Sydney. It will be a punishing day in Honkers as I rarely sleep on flights and B has an extensive shopping list for me. The transit rest options are quite expensive too and unlike everyone else (or so it seems) I don't have airline club membership. As the hour of my departure approaches so too is my sadness at leaving my family behind. Every moment with them is precious. Last night I was forced to stay late at work and I was brought to tears by the thought that Alex may fall asleep before I returned. I would miss out on feeding him dinner, bathing him one last time before I go. Fortunately, I made it back in time. And now it is time to leave again. Imagine being blown out of an airfraft high above the land. What would you do? According to a recent research Hydrogen Sulphide, or rotten egg gas, could play an important role in male erections. It gives a new meaning to those awful late night Nasal Delivery Technology advertisements! 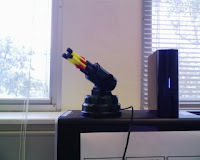 Thanks to my colleague Daniel the evil lair (ie office cubicle) is now defended by a missile system. Annoying users can no be dealt with directly from the PC - there is no longer a need for me to get out the bamboo stick. They will feel the force of cold, hard foam against their weak skin! What was really amusing is that the missile launcher didn't work out of the box. It would move around, but the rockets failed to fire. 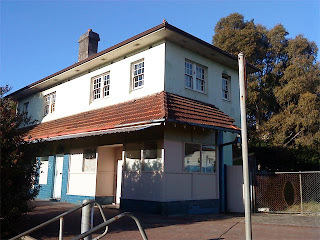 A search of the forum revealed that this was not an isolated problem. Thankfully, the solution was simple. Just hit the rear of the launcher a couple of times! I like a problem that requires a violent solution. Muhahahaha! On Saturday we were doing a rare shopping trip to Bankstown when we discovered the Lunar New Year festival celebrations. There were crowds, stalls and dancing display with the event compered by the popular comedian Ahn Do (pictured below). Had a very enjoyable Vietnamese lunch at the My Canh restaurant, along with many other parents and strollers. They serve the best tomato sauce rice that I've tasted. This afternoon I had my first Japanese tutorial with Noriko. Learned to talk about likes and dislikes, along with family. One of her Japanese friends lives very close to us. It was interesting to find out that we have seen so much more of Japan than they have. It's a photo by Shogo Yamahata (©) of Tanaka Kio trying to breastfeed her 4 month old son as he lies dying. They were victims of the atomic bomb blast over Nagasaki. Seeing this and the other photos of Ms Tanaka and reading more about her story brought me to tears. The thought of experiencing something like this with our own son is horrifying. I have not visited Nagasaki before, perhaps we will this time. We did go to the Hiroshima Peace Memorial Museum back in 2006. The memorials, the stories, the models of schoolchildren with their clothes burned off their backs, they affected us deeply. War is not a game and atomic weapons are not tools that anyone should contemplate using. I hope no child will die ever again through a nuclear bomb. Day 13. Middle of summer. Bloody hot. Went swimming to cool down but returned in agony after the box jellies got me. Was hospitalised briefly. Day 27. Decided to investigate the rock pools. Thought I saw movement under a rock, so I lifted it up. Saw an octopus which suddenly flashed blue rings. The blighter bit me. Was in agony. Went to hospital on the mainland for a few days. Day 30. Thought the weather was supposed to be perfect in Queensland but today's been windy and wet. Day 34. Tropical cyclone Howard hit yesterday. Blew the roof off me shack and I was struck by debris. Got 20 stitches. Day 48. Shack was struck by lightning and my computer fried. Was supposed to get my new PC last week, but they are really slow up here. Day 58. Was walking on the beach picking up shells when a cone shell shot me full of neurotoxin. Doctor said I'm lucky to be alive. Day 70. Woke up to find a taipan snake poking his head in through the window. I jumped but it still bit me. Went to hospital again for a few days. Day 80. Was walking near the rocks when I felt a stabbing pain in my foot. I had stepped on a stonefish. Had to go to hospital. Day 88. Visited the mainland and went for a swim in the creek. I was lucky to escape the crocodile with only a chunk taken out of my left thigh. Day 92. Apparently the itchiness and pain in my leg is due to an infection from the coral that scratched me while snorkelling off the reef. On some pretty strong medication. Day 94. No worries about getting the stitches out from my left thigh. The shark bit the whole bloody leg off. That'll teach me to go swimming with a bleeding wound. I knew that the head of Qantas, Alan Joyce, studied mathematics at university, as did (uggh) right wing columnist Miranda Devine. I didn't know that it might be the only thing she shares in common with South Park co-creator Matt Stone, who has a joint major in film and mathematics from the University of Colorado. Other (more) famous people with mathematics degrees include past and present presidents of Singapore, Peru and the Philippines, along with Teri Hatcher and Art Garfunkel. We picked up our new car today. It's a Mazda 6 and it's red (Copper Red, to be precise). Now I have some leg room again and there is space in the boot for something other than a pram. Bit sad to say goodbye to our traded-in Mazda 3. It's been an excellent car and never given us any problems. The Mazda 6 has a few more features than the 3. It's going to take time to play with all the buttons. I preferred the red lighting of the Mazda 3 dashboard, like the eye of a cylon, as opposed to the blue of the 6. Radioactive Red as opposed to Cerenkov Blue. They are made in Hiroshima, you see. At least the 6 plays the "Zoom Zoom" music when it starts up! It was taken at Ritsurin Gardens in Takamatsu in Japan. Most of my photos can be seen on my Picasa site.